Last summer (June 2013), Professor John Goheen attended the Peace and Justice Conference in Nairobi, Kenya, where he spent time mentoring high school and college students who were interested in learning about video production. While working with the students there, Goheen produced a short documentary called The Ball, about young boys who make soccer balls from garbage. Here’s what Goheen said about working in Africa and the production of The Ball. “My first visit to Africa was in 1991; destination Somalia. I went to cover the civil war and famine that had enveloped the country. 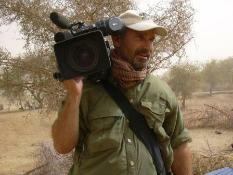 I was a 36-year-old television photojournalist who had only covered one other story outside the US. Needless to say, that experience changed my life and was the beginning of a great fondness for the continent that continues today. Since that time I have been to nearly 20 African countries covering death, destruction and deprivation. But in June 2013, I attended the Peace and Justice Conference in Nairobi, Kenya, where I spent time mentoring young students interested in learning about video production. At the conclusion of the conference I asked some of the students if I could visit their community. Inspired by a recently read article, I proposed a story idea of profiling young boys who made soccer balls from garbage. Through the help and support of my student volunteers, we were able to capture two boys who routinely make their own soccer balls. In fact, a student Goheen worked with in Kenya named Maureen Atieno Koli was so impressive, that he has helped to secure her an opportunity to study in the U.S. You can read all about Maureen’s story here.